Believe it or not the first day of Winter is almost upon us; December 21st will be here before we know it, although for some it already feels like the middle of Winter with blustery winds and low temperatures causing shivers. People often say that they find this time of year the hardest to get movin’, what with the sun setting so early and the desire to stay under the covers for as long as possible at any given time. Unfortunately, since colder temperatures mean layers of clothing, it’s easy to pack on some pounds without completely noticing until it’s time to retire those sweatpants for next year. Weather can undoubtedly be a hindrance to being able to get outside and work up a sweat, but that’s when we need to get creative. Look up a local Pilates and/or Zumba class and give it a whirl! Lace up those sneakers and indulge your senses in some window shopping for things you can only dream about purchasing while power walking the mall. Borrow your children’s Wii game console and try some of the Wii Fit exercise programs to help get you going. Finding an activity that you find fun is the key to making exercise a permanent part of your routine. Think of exercising as “my time” to clear your head and get out any stress/frustration. Dragging yourself sluggishly to the gym is not going to yield a productive workout if you’re not giving it your all and are just going through the motions. We’ve all been there…”Come January 1st I’m going to go to the gym everyday” or “For the New Year I’m giving up sweets.” Ah yes, good ol’ New Year’s resolutions; we have a tendency to make them quite stringent and then when we “mess up” and maybe skip a day at the gym or have a piece of candy, the whole effort seems all for naught and the proverbial floodgates open to a smorgasbord of empty calorie foods. We need to change our mentality so that we avoid beating ourselves up over a perceived “failure” and accept that we are human beings and not only do we make mistakes, but that it is permissible to occasionally indulge or even skip a day or two at the gym. The important belief to subscribe to is take one day at a time and if you have a day where you overeat or miss the gym, tomorrow is another day. Seize the next day and get back on track with eating well and exercising. Depending upon the resolutions that are made, I believe they can be subconsciously self-defeating because their goal may be to hold a person to an unattainable level of accountability. For instance, going to the gym on a daily basis sounds like a great idea, but in practice perhaps not the most realistic. Hence, we are unintentionally setting ourselves up for frustration. 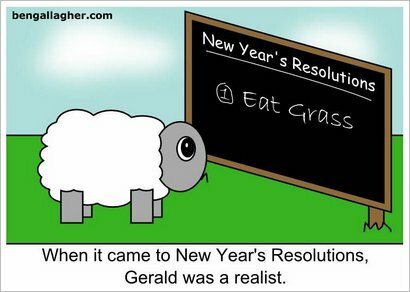 Instead of New Year’s resolutions for 2011, how about making healthy promises to yourself, (i.e. I promise to be more active to improve my health and exercise 2-3 times per week) and start now! As you see yourself meeting this goal consistently, then take it one step further and promise 3 times per week. This way, you are building on a successful behavior instead of trying to accomplish too much too quickly. Furthermore, why wait another month or so when you could begin keeping your promise to yourself now? The time of year is upon us where folks begin stocking up on pantry items and ingredients in preparation for Thanksgiving; the meal where everyone is expected to take cat naps after dinner and then gather around the table for a second round with turkey sandwiches and all the fixins’. Why not make this holiday centered around family and friends versus what’s on the dinner table? Make no mistake, I am by no means suggesting that we throw traditions out the window, but in the best interests of our health and well-being, let’s lighten up that spread a little, shall we? Turkey, stuffing, sweet potato casserole, mashed potatoes, pumpkin pie: just a few of the foods that come to mind when the word “Thanksgiving” is uttered. Remembering to give thanks for being surrounded by our loved ones and savoring the foods, as well as precious moments together, is at the top of my list. About a month ago, I lost my grandmother to lung cancer and I will be thinking of her especially on Nov. 25th wishing she could join us. As a tribute to my grandmother, I have come up with some healthier alternatives to her classic Thanksgiving favorites and I hope you and your family enjoy! Instead of mashing sweet potatoes and loading them up with butter, sugar and marshmallows, try this! Slice your sweet potatoes into thin rounds (skin on so we can benefit from the fiber, vitamins and minerals in the skin), toss in olive oil with rings of sweet onions, drizzle with 2 tablespoons of pure maple syrup, sprinkle with cinnamon, allspice, nutmeg and roast at 400 degrees F until fork tender. People seem to take a special liking to mashed potatoes when made with cream and butter, but our arteries sure don’t. Take your potatoes and rub the outside with olive oil so the skin gets crispy, bake at 450 degrees F for about an hour; scoop out potatoes and put hollowed out potato skins aside; add potatoes to a mixing bowl with 1% milk and Brummel & Brown Spread until you achieve a creamy consistency; add cooked broccoli florets, (or any veggies to your liking, i.e. spinach, scallions), and mix thoroughly; add potato mixture back into potato shells, top with low-fat shredded cheese and bake until cheese is melted. Combine all ingredients in a bowl, and mix thoroughly. Once ready to serve (it’s delicious eaten hot or cold), cut into 9 pieces. The past two weeks have been extremely crucial in my weight loss journey. I was at a standstill and I knew that I had 3 pounds to lose and it was turning out to be extremely difficult. Until I started this diet I was always under the impression that calories were important. The first weeks starting this diet I did not pay attention to it too much. I followed the diet exactly like I should have been and it really was working. However, I am the type of person that likes to have numbers to back up what I am doing. I contacted Miss Chef RD and asked a question regarding calories. I wanted to know as she was preparing this diet if she took calories into consideration. Her answer was simple, yes and no. She advised me if I followed the diet, portion sizes, and making sure I ate enough of each serving she recommended that I was in turn eating the right amount of calories. This fascinated me because I felt like I was eating more calories then I should. I decided to take it upon myself to not only stick to the diet that I have been on the past month, but I also wanted to keep track of calories to make sure that I was not over eating. The past 2 weeks have been extremely interesting and a challenge to track but I feel like the results that I will share with you are very interesting and important to keep in mind. On the Miss Chef RD diet eating 6 times a day is a huge part of the process. 3 of the meals I eat daily are protein. I have 2 protein shakes and 1 balance bar every day. This is a crucial part of the diet. When I added up those calories it came to 460. I was shocked that just in protein I was eating 460 calories and that is not even including the meals that I ate on top of this. I found out that the appropriate amount of calories I should be consuming was around 1200. I first subtracted the 460 calories worth of protein that left me with 740 calories. I thought for sure that I was eating way over 740 calories with the remaining three meals. I started closely tracking them for the rest of the 3 meals. For breakfast eating a Chobani yogurt with an apple was about 170 calories. At lunch, eating a sandwich with whole wheat bread, turkey, or ham with vegetables came to around 250 calories. This left me with 320 calories for dinner. I tried a lot of different combinations. I had grilled chicken, with a small potato, I made different kinds of salads, or even made tuna sandwiches for dinner, and what surprised me the most was I was usually under the calories allotted for that day. It was interesting to track the calories for the past couple weeks because it really showed me that it really isn’t about calories, it is about portion control. I was eating like I always had been on this diet and without knowing I was eating the exact amount of calories that I should have been eating. I have lost 9 lbs from doing this diet. I have one more lb to go and will continue to go past the 10 lb mark. It has been challenging the last couple weeks because the last few pounds have been hardest. Throughout these past weeks one significant difference that I have changed in my diet is giving up soda. It was difficult at first not having a diet Pepsi with lunch or a diet soda at dinner, but that is the one thing I have changed that I am really happy about. I feel like giving up soda really was the difference in doing this diet and I feel better all around now that I don’t rely on the carbonation anymore. I never thought that I would completely give up drinking diet soda but it really was for the best and I think it was extremely important in this diet. I feel strongly that after this week I will hit my goal of losing 10 lbs and I am anxious to continue on with this diet plan. This week for me was all about mixing and matching meals. I had been continuously eating the same kinds of meals for each of the 6 meals. I was starting to get a little bored, so I decided to mix it up a bit. I started eating salads again at lunch. I used to eat salads all of the time but stopped because I was so concerned with making sure I was eating the right servings of the right food groups I was strictly sticking to just having a little side salad once in a while with dinner. I started making salads with grilled chicken, a little bit of egg, and the basic vegetables. To make sure that I had a carb, I had a piece of wheat bread with my salad. I liked the change because it gave me more of a variety then just sticking to a certain kind of sandwich or wrap. The days that I had a salad at lunch, for dinner I would make a sandwich. I would have turkey, half a slice of cheese, lettuce, tomato, and hummus. Hummus brings a really good taste to a sandwich. With my sandwich, I would make a vegetable. I usually would make asparagus, corn, or broccoli. By starting to eat salads at lunch again, it really helped me make mix up the meals I was preparing. Cheat day this week was especially good. I was home in Maine for a wedding. The cocktail hour started with cheese, crackers, spinach roll ups, crab tarts, and different kinds of fruit. The first course of the meal started with a salad. It was a spinach salad with a raspberry vinaigrette dressing. The main course consisted of a choice between prime rib, chicken, or stuffed haddock. I opted for the chicken, and it was really worth it. The big part of the actually “cheat day” came after they cut the cake. The cake was extremely good and definitely made the day a cheat day. This week I continued to work out, but because of my weight loss last week I was not expecting to lose a lot this week. I was really afraid to start gaining weight because of working out I figured I was gaining muscle. I ended up weighing in and I stayed the same. I was extremely happy because I only have three pounds left to lose and I definitely did not want to go backwards. I know that the last 3 pounds are going to be the hardest but I’m hoping for a loss this coming week. Q: Hi, I have recently started using the WHEY Protein power for shakes. There are so many different kinds. I currently have the EAS WHEY Protein. What is the difference? Also, which one is better for you if your dieting? Thanks! You couldn’t be more right! There are so many different kinds of protein powders on the market it can be quite overwhelming trying to decide which one is best for you. Choosing a whey protein powder is ideal because whey protein is a deriviative from cow’s milk, meaning it’s an animal based protein and is best utilized and absorbed by the body. Whey protein has the highest Biological Value (BV) of any known protein, which means that the proportion of protein that is absorbed and incorporated into your body’s proteins is higher from whey protein than from other protein sources, (i.e. soy, rice, egg white, etc.). In other words, excellent job selecting a whey based protein powder! EAS Whey protein is a great choice if you are looking to lose some unwanted pounds. It has a small amount of fat and carbs, but a healthy amount of protein per serving. Using it to replace one meal per day helps to ensure you are meeting your protein needs and not loading up on carbs and sugars for the meal that is being replaced. Many of my patients have a protein shake in the morning as their breakfast, which also helps them to avoid bagels, muffins, cereal, donuts, etc., which can cause tiredness and lethargy because of the large amounts of carbohydrates they contain. Good luck on your weight loss journey Kimberly!! This past week has been the most gratifying so far. After last week, losing nothing, I was a bit frustrated. I kept working at it. The key for me this week was trying new foods. I am not an incredibly picky eater, but I definitely stick to my norm. This week I decided to take a chance on new food that Ms. Chef RD suggested. I tried salmon. I was always afraid to try it, but after I did I ended up really liking it. I tried an assortment of new vegetables, some I liked, some I didn’t. I was extremely happy that I tried because I was able to come up with new salads, and new meals that made it more exciting to continue on this diet. I tried a new kind of protein shake. I always stuck to vanilla but this week I tried the chocolate. At one point during the week I even mixed them! It was a new taste but good, and I’m glad I have more of a variety. Now that the food was bringing a routine, I really had to make sure that I was working out. As I mentioned I am coming off of ACL surgery so I have to be extra careful with everything I am doing to work out. I have only been allowed to run on my own for a week now, and I am already up to 2 miles! I was extremely sore this week, and hungry because of the exercise, but I stuck with it. I knew that something had to pay off. I weighed in and I had lost 2 lbs! I was so excited because not only was I frustrated with not losing any the week before, but I kept going. I tried new foods, I tried new workouts that I could do, and it paid off. This week has been a great one because I know that I was at a breaking point of stopping, but I didn’t. I want to honestly say to anyone who reads this that sticking with this diet and adding a workout is the best thing I have decided to do since I moved here in June. I urge everyone to start; it makes a world of difference. I feel better overall, but especially I feel healthier, and even more productive at work. I look forward to seeing how far I can go with this new lifestyle. Fiber: Feel Full and Keep Your Stomach A Happy Camper! Fiber has gotten a bad rap in the past with people envisioning bloating, discomfort and gas as an instinctive association. It is true that if certain foods, (i.e. beans, broccoli, onions, cabbage) are consumed in large quantities they may cause the abovementioned symptoms, however not all gastrointestinal tracts are the same and tolerances vary by individual. Fiber should be an integral part of one’s regular diet; not only does it help with bowel regularity, but eating foods high in fiber help people have a sustained feeling of satiation. For fruits and veggies with skins, (i.e. potatoes, pear, apples, etc. ), don’t peel them before you eat them…consume skin and all to reap the benefits of fiber and extra vitamins and minerals. If you want to be able to “sneak” some extra fiber in your diet without having to eat a bushel of apples a day, put on your thinking cap! Desire some extra crunch in your salad, yogurt or cottage cheese?? Add some Fiber One cereal for a hint of sweet fiber goodness! Try dicing up some dried prunes and toss them in a salad as you would dried cranberries. The Hungry Girl website, www.hungrygirl.com, has plenty of great recipe ideas that involve using Fiber One cereal as a crust for chicken and other foods for a healthy oven-fried taste and texture. So, go ahead and jump in the kitchen to start coming up with ways to fit more fiber into your family’s diet!